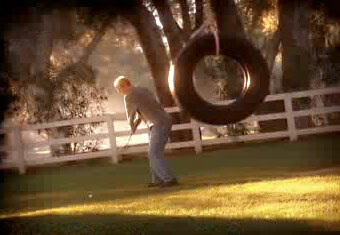 In the many decades we’ve been on planet Earth, we’ve never seen a golf ad we liked, let alone one that got us to laugh. But this new spot for Cleveland Golf’s Cleveland 460 Comp Driver does the trick, because it’s a brutally funny take-off on erectile-dysfunction ads. It’s not just that the club promises to treat “trajectile dysfunction” or that the company had the … well, you know … to register the domain trajectiledysfunction.com. The commercial also includes all the hallmarks of the erectile-dysfunction-commercial genre (except, maybe, for an appearance by Bob Dole). There’s the randy wife looking on amorously, the warning that “in rare occasions, players have been known to stay long for more than four hours” and, in a nod to that Levitra ad, a guy hitting a golf ball through a tire swing. Aw, we’ve given it all away. Just go watch the thing (there’s a funny intro thing first). According to USA Today, it was created by a small California shop called Brainsaw.